A job notice has been advertised in the form of CG assembly recruitment by the Chhattisgarh Vidhan Sabha Sachivalaya. Inspired and dynamic jobs, Hunter will have to complete the application form through online application through online mode for 02 unspecified posts of Hospitality Officer, Assistant Hospitality Officer, before the last date of 14th September 2018. Fans who meet the requirements for CG assembly jobs and can get more information about CG Assembly Recruitment 2018 from this page which is well presented by the team of www.telanganaa.in. Education information: Those candidates have a minimum qualification because the candidates desiring to apply for CG assembly jobs should have a certificate in computer course from Bachelor Degree / PGDCA / any recognized institution. Candidates applying for the above post and related to general / all categories, they have to pay the application fee. 350 / -. Candidates belonging to OBC candidates of CG State will get Rs. 250 / - in the form of application fee. Candidates belonging to scheduled caste / scheduled tribe / pH of CG state will get Rs. 200 / - in the form of application fee. Applicants should be between 21 to 30 years (for other states) between 01-01-2018, 21 to 40 years (for CG states). Approval: Hospitality Officer, Assistant Hospitality Officer, for the posts of candidates, Rs. 43,200 - 1,36,500 / - (post 1), Rs. 38,100 - 1,20,400 / - (post 2) which is introduced by the Chhattisgarh assembly secretariat. CG Legislative Assembly application process to fill the application? Visitors have to go to the official website to apply for CG assembly and this is http://www.cgvidhansabha.gov.in. Date of filing of online application form is to begin: 31-08-2018. Last date for online application is: 14-09-2018. Click CG Vidhan Sabha recruitment notification here. Click CG Vidhan Sabha recruitment notice here. Vidhan Sabha Secretariat has closed a vacancy notice regarding the recruitment of the Vidhan Sabha Secretariat. Careful and dynamic candidates must present their application form for 07 vacancies of assistants Martial before the deadline 4 August 2018. Qualification: Those hunters who have graduated from a recognized university or institution can apply. Applicants who request one of the above publications and belong to the General category must pay a registration fee of Rs. 350 / -. Applicants in the OBC category have to pay Rs. 250 / - as registration fee. The age of participants should be between 18 and 30 years (for other state candidates), 18 to 40 years (for the candidate CG) as 2018.01.01. Remunerations: Candidates who have been successfully recruited receive a salary of Rs. 35,400 - 1.12400 / - of the recruiting organization. Jobseekers are selected on the basis of their performance in the written test and the physical efficiency test conducted by the selection committees. First, focus on the website of the Ministry of Vidhan Sabha is http://www.cgvidhansabha.gov.in. The deadline for the online application is: 04-08-2018. 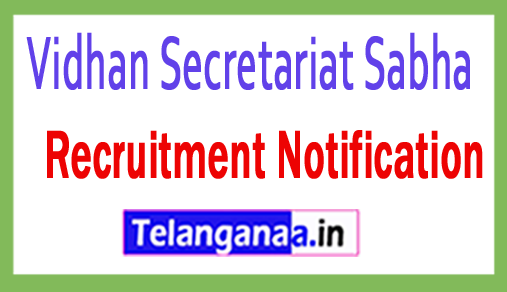 Check Vidhan Sabha Secretariat recruitment notification here.